Take a look at our Need To Know tab! At LDSREalEstate.info we provide information to make the best and most informed decisions when you buy or sell your home. 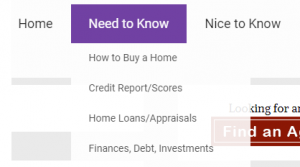 In the Need to Know tab at the top of our site, we have many articles to help make sure that you are prepared and aware of each aspect of buying a home! Each section of Need to Know provides information about a variety of topics. Below is a brief preview of each of the topics under Need To Know. Take a look! Floods and Earthquakes: Are You Covered? Whether you are buying or selling a home, use our articles above and be prepared! When you are ready to get started, LDSAgents.com will help you find the right LDS realtor for you!